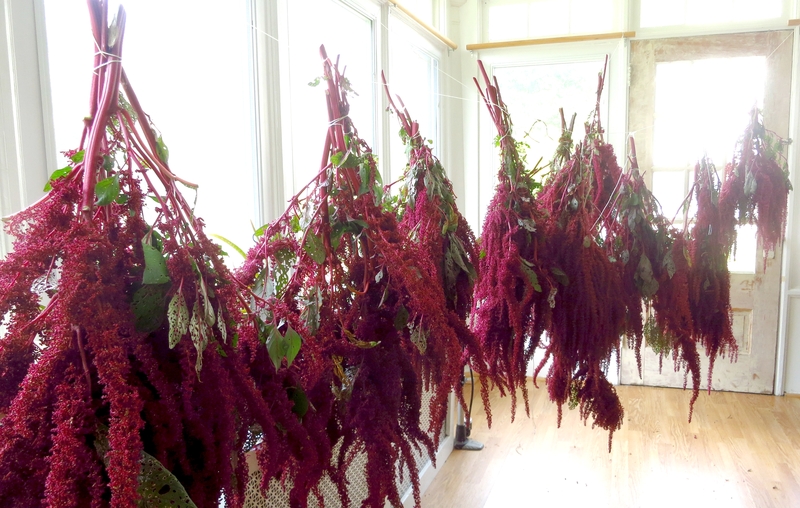 I hung the amaranth to dry for seed harvest in our front porch “barn” on our front yard “farm.” Lots of seed on these beauties! ADDENDUM: One of the attitudinal principles in permaculture is “Mistakes are tools for learning.” Oh, yeah! Black seeded amaranth is not, I’ve discovered, the nicest stuff to eat. It is much more gritty than the white seeded amaranth. This particular amaranth is good for eating the greens and, even, I understand, to use for dye. While the seed can be eaten (I might give it another shot)…I think the chickens will be getting a fair share of this crop! This entry was posted in Edible Landscaping, Organic gardening, Uncategorized and tagged Amaranth, black seeded amaranth. Bookmark the permalink. I have this growing wild in my yard. Totally thought it was an ornamental celosia volunteer. I let it grow because it was pretty, but hot damn, now that I know this is amaranth, I’ll be “robustifying” my homemade granola bars this summer!